People gather outside the funeral service for Eric Garner at Bethel Baptist Church in Brooklyn on July 23, 2014. The Rev. Al Sharpton said Saturday that he will lead a protest “march across the Verrazano-Narrows Bridge in New York City later this month in response to a medical examiner's ruling that Eric Garner was the victim of a homicide after police placed him in a chokehold last month.” the Los Angeles Times reports. He made the statement during a rally at his Harlem-based National Action Network and was accompanied by members of Garner’s family, the report states. The march is planned for Aug. 23 and Sharpton urged Richmond County Dist. Atty. Daniel Donovan to move toward an arrest, the Times writes. Daniel Pantaleo, one of the officers involved in the incident, has been stripped of his gun and badge during an internal investigation. Another officer, Justin D’Amico, has been placed on desk duty. The police department has not commented on the medical examiner’s report. A day after the New York City medical examiner ruled that the death of a 43-year-old father from Staten Island, N.Y., was caused by a police officer’s illegal chokehold, his family plans to discuss the finding today at a rally alongside the Rev. Al Sharpton. Sharpton, the civil rights activist and MSNBC television host, has been a major voice in the case of the July 17 death of Eric Garner, meeting with Mayor Bill de Blasio and Police Commissioner William Bratton. The rally will be held at Sharpton's Harlem-based National Action Network. The Associated Press reports that New York City medical examiner's spokeswoman Julie Bolcer said Friday that the death was a homicide. Garner died from “the compression of his chest and prone positioning during physical restraint by police,” Bolcer said, according to the AP. She also said “asthma and heart disease were contributing factors,” the report says. 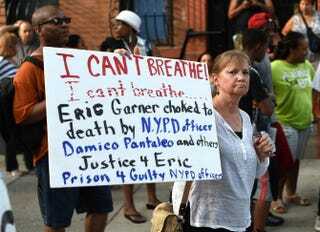 Police have not said whether they found any loose cigarettes, or "loosies" as they are commonly known on the streets, in Garner’s possession and Attorney General Eric Holder has said the Department of Justice is closely monitoring the investigation into Garner’s death.